Manchester United goalkeeper David de Gea says his relationship with manager Louis van Gaal is "normal", but not friendly. 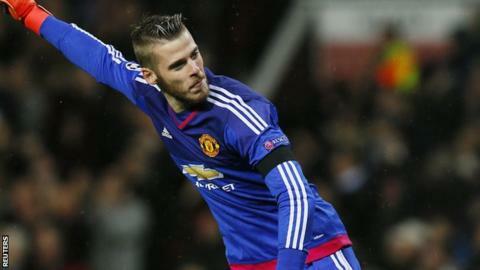 De Gea was dropped from the first-team squad by Van Gaal before a proposed move to Real Madrid fell through. "He is a hard and strong coach," the 25-year-old told ESPN. "With any coach, you have a lot of respect for him, but it is difficult to be their friend." The Spaniard added he was "really happy" to have stayed at Old Trafford. De Gea almost joined Real on the final day of the summer transfer window, but the necessary paperwork was not submitted in time. He then signed a new four-year contract at Old Trafford. De Gea said: "I'm really happy now, at one of the biggest clubs in he world, where I feel loved by the fans. "Nobody let me down or disappointed me - during the market anything can happen, it can all change inside a minute. "There were difficult moments, strange moments, but they help you to mature. To be stronger." De Gea praised Van Gaal's "aggressive" mentality - which he says the team try to replicate - and said their relationship has thawed since the summer. "From outside, you see a person with a lot of character, which is what he is," he said. "He is a good person. You can talk with him about anything you want, and face to face he is sincere. We have a normal relationship between a coach and player. We both want what is best for the club. "From the first I day I came back, after all that happened, he gave me a lot of confidence, told me I would play, to relax and keep doing what I had done before." De Gea also praised the reception he received from United supporters at his first match of the season, a 3-1 win over Liverpool. "The first game I returned, after all that had happened, was impressive," he said. "The way Old Trafford received me, it made the hairs stand up."